Over the weekend I picked up the latest album from one of my favorite bands, Metallica. 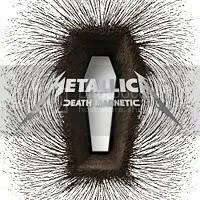 Death Magnetic is the band’s ninth studio album, the first without Bob Rock (producer) and the first to have Robert Trujillo on bass (yes this is the first ALBUM to have Robert on bass he was hired AFTER St. Anger was recorded, Bob Rock actually played most of the bass on St. Anger). This album follows St. Anger which many fans consider a failure. I, personally, enjoyed the songs and writing on St. Anger but HATED the production. It sounded like they had recorded the album inside of a trash can. The album lacked extended guitar solos, but I always felt guitar solos were best saved for live shows anyways. The only track that I at first gave a “WTF” was “The Unforgiven III.” Which, I assume, is a follow up to the Black Album’s (yes I know it’s official title is “Metallica“) “The Unforgiven” and ReLoad’s “The Unforgiven II.” The soft nearly angelic piano and string opening sounds out of place. Soon the drums and whine of the electric guitar come in, but the song would not be considered “hard” by many fans. I do, after a couple times through, enjoy the song, though I believe “The Unforgiven II” is still the best in the, now, trilogy. Death Magnetic is exactly what I expected from a Metallica album in 2008, it’s not your mom’s music, but it also isn’t the Black Album. The instrumental parts of the songs are strong and are ready to be blasted in your car and waiting for you to head bang in the concert until your ears bleed. The vocals are not what they used to be. James Hetfield’s voice has progressively changed over the years, probably from the absolute beating the early Metallica touring would have given his vocal chords. Is it bad singing? I wouldn’t say that, but controlled vocals are not what made Metallica. If there was something I was hoping for as a (very bad) bass guitar player, was that they would have allowed Robert Trujillo to really bring out more of his style of playing. I’ve seen him (on video) in concerts and he can absolutely shred the bass, but it seems that they have continued to keep the bass player a low key part of the sound on the album. The bass line is a wonderful driving rhythm pushing the songs along along with Lars Ulrich on drums, but I think it could have been featured more than what it is. I must mention a few (very) small things that irritate the heck out of me with this album’s packaging. First, the booklet is built into the cardboard case. I don’t like that because I rip my CD’s and then keep the discs with the booklet in a nice holder for safe keeping. I can’t get the whole case in the holder, so the only options are no booklet, or to try to rip the booklet out without destroying it. Second, the coffin you see in the picture is “3D” in the packaging. Each page of the booklet and the cover are progressively cut out narrower and narrower. Very cool, until you start flipping through the booklet and seeing that parts of the lyrics are actually cut out! That is right, the hole in the cover actually means parts of words/whole words are missing on the lyric pages (although it doesn’t matter they gave the instrumental track two pages for lyrics…yea two blank pages). I like to sing along, and while I can pick up lyrics pretty fast, I still like to read along when I first get an album home. Finally, the songs and their lyrics are listed in the book OUT OF ORDER! The first song in the booklet is “My Apocalypse” which is the final track, so I thought they were backwards, WRONG! Just random it appears. All in all I would give this album 3 out of 5 stars and would recommend at least a download of a few songs for those of you who like the hard rock/metal genre. Below I have embedded the first music video from the album. Oh, one last thing. THANK GOD for Metallica going back to the ORIGINAL Metallica logo! Nice review. If the library buys a copy I might check it out and give it a listen. I’ll have to come back with sound to watch the video. I can’t wait till November to see Metallica in concert again! The Death Magnetic CD is sickly AWESOME! I have seen them 3 times previous (they don’t always make it up here to Portland)…It sucked cause tickets sold out in minutes and when I got to the checkout to buy them I hit refresh cause it started at like 2 mins then went to 11 mins in wait time, etc…Anyways I missed out on them but got them from that tickets for face value site eSellOut anyways: http://www.esellout.com/ResultsGeneral.aspx?kwds=Metallica ~ if anyone else needs tickets for the Rose Garden here in Portland (or I guess anywhere else for that matter) the site ROCKS!